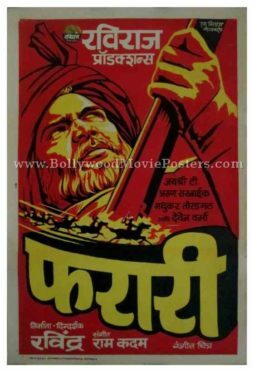 Old Marathi movie poster of the film Farari (1976) for sale. This is an actual surviving old movie poster of the 1976 Marathi movie Farari that was produced by Raviraj Productions. Printed and circulated during the first release run of the film (mid 1970s), this old Marathi movie poster was originally designed for publicity of the film but never ended up being used. This beautifully designed old Marathi movie poster was originally hand painted on canvas by noted Bollywood poster painter S. Vilas. Bright red and yellow hues have been used in the design of this old Marathi movie poster making it very appealing.